Christie's E-Z Loader is made specifically for high capacity magazines for the Ruger 10/22 (but it will not work on the Ruger BX-25 magazine. Click here for a Ruger BX-25 Magazine Loader ) and is small enough to carry in your pocket. Now you can load those magazines with ease ! Once you get the rhythm going you'll be amazed how quickly you can load the magazines! The E-Z Loader works with all high capacity magazines including those from Butler Creek, Ram Line, and Pro Mag. 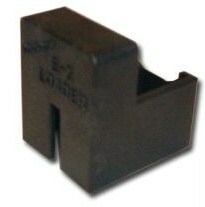 The E-Z Loader is made of polymer (50% glass filled). It is durable and resists oil, grease and acetones. Once you get the hang of this unit it works pretty slick, and the price is right too. If your looking for a simple loader for those 25rnd mags, this is it. Just be aware it is meant for the hi-cap magazines, not the factory style.